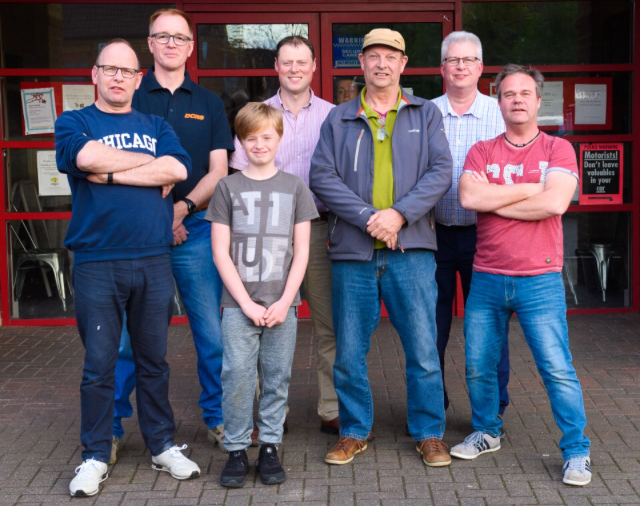 During a Club meeting back in May 2017 several members of the Huntingdonshire Amateur Radio Society (HARS) got together as a small group and agreed to take part in the On-Line Bath Distance Learning Course to see if they could gain the next level of radio operator licence and be the holder of the elusive Mike Zero callsign. Word soon got round which sparked a bit more (pardon the pun) interest in the course to the fact that seven members were ready to join in on the 2017/02 course which started in Jun 17. The small group met several times on a Wednesday night at a local pub for the purpose of exchanging notes, chatting about each other's findings of the first couple of modules and having some liquid refreshment, although this it was a good idea we soon realised that instead of meeting as a group it was far better to spend the time studying and talking over anything which needed extra coaching or information we would use a local UHF frequency, so the Tuesday Tech Talk Net was born using the GB3OV Repeater this being chaired by David M0VTG. This helped out many of the candidates achieve a better understanding of some of the modules as they could gain quite a depth of knowledge and experience from other club members live on air. After completing the modules, assessments and mock exams during the course, the candidates were ready to take their exams in early January 18 at the local exam centre in Peterborough, this went ahead in between the bouts of winter weather we had then the wait for the results to be posted in about two to three weeks time began. Not to be outwitted and whilst the Advanced Course was going on two of the new club members agreed to sign up and take part in a weekend Foundation course run by the Peterborough Club (PADARC) which they successfully passed and so they applied for their M6 callsigns. Not to be left out two of the other regular members who had M6 callsigns already vowed to take their Intermediate Course which would be held again by PADARC over a weekend. The feedback was that they had passed and obtained their 2EZero callsigns. So as the HARS Club entered into Mid February with the tally of 10 members who had successfully taken part in various courses during the second half of 2017 with one Advanced to still take his exam at the end of April 18. Talking to the each group of candidates many said how they had learnt many new skills, levels of knowledge and were pleased at other meeting people with the same interest and that it would set them up for a very enjoyable hobby in Amateur radio in the coming years. Candidates who passed are Billy M6OBX, Clive M6OZX, Mark 2E0ENL, Richard 2E0FRG, Mark M0UZE, Scott M0KFI, Simon M0ILR, Marc M0IMG, David P M0PYC, David W M0SKT, well done to all in passing. "BBC Radio Northampton brings you the story of how one man changed the life of his school and community, forever. More than 100 years ago, Frank Wright used dots and dashes to open children's minds to the world during his time as headmaster of Bugbrooke School from 1887 - 1919. Produced by Tom Percival." Thanks to Sid for pointing to a web page which now allows a free (and legal!) download of one of the best VHF/UHF books. You must go to the linked website "M0JCQs Ham Blog" (click on the icon) in order to download. "Recently Trevor Preece (G3TRP) has made this book available in a digital format as a PDF. This means a new generation can now read this well of knowledge, on a subject that’s pretty unlikely to be written about again due to the decline of interest in VHF."